Mob Event Added: Sharknado - Spawns Roas with constant whirlpools and the ability to breath in the air and fly! 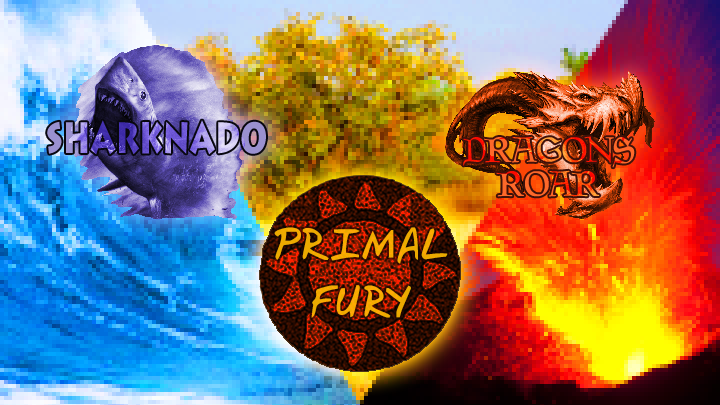 Mob Event Added: Primal Fury - Spawns Wargs, Barghests, Maugs, Feradon and Dawon. A big thanks to @UndulateOak for doing the voice announcements of these new events! Fixed Boss Events spawning random subspecies instead of being exact based on the type of Soulkey used. The Roa's whirlpool will no longer affect entities with a high momentum in order to prevent them fling entities too far as well as allowing them to combine their whirlpools together. New global Mob Event setting added: Aggressive Events, if changed to true, mobs spawned from events will immediately target the player and then will home in if close enough. Changed the default spawn settings for Inerno mobs, you will need to delete this config file in order to use the new settings or manually update it. The block costs have all be reduced (none higher than 16) as 32 was too much causing the mob to not spawn. Rahovart's Hellfire Wall and Hellfire Fire now use new textures in order to make them more distinguishable. Doubled the rate that Astaroth heal Asmodeus in phase 3. The Wildkin should no longer have a solid collision box. ============================================================ Lycanites Mobs Update: Dragons Roar - Version 1.17.1.1 for Minecraft 1.11.2 Configs older than 1.14.2.2 will be reset. ============================================================ -------------------- New Features: -------------------- Mob Event Added: Sharknado - Spawns Roas with constant whirlpools and the ability to breath in the air and fly! Mob Event Added: Dragons Roar - Spawns Quetzodracls, Morocks and Ignibi Mob Event Added: Primal Fury - Spawns Wargs, Barghests, Maugs, Feradon and Dawon. A big thanks to <a href="https://twitter.com/UndulateOak">@UndulateOak</a> for doing the voice announcements of these new events! -------------------- Major Fixes: -------------------- Fixed Boss Events spawning random subspecies instead of being exact based on the type of Soulkey used. The Roa's whirlpool will no longer affect entities with a high momentum in order to prevent them fling entities too far as well as allowing them to combine their whirlpools together. -------------------- Config Changes: -------------------- New global Mob Event setting added: Aggressive Events, if changed to true, mobs spawned from events will immediately target the player and then will home in if close enough. Changed the default spawn settings for Inerno mobs, you will need to delete this config file in order to use the new settings or manually update it. The block costs have all be reduced (none higher than 16) as 32 was too much causing the mob to not spawn. -------------------- Changes: -------------------- Rahovart's Hellfire Wall and Hellfire Fire now use new textures in order to make them more distinguishable. -------------------- Balancing: -------------------- Doubled the rate that Astaroth heal Asmodeus in phase 3. -------------------- Minor Fixes: -------------------- The Wildkin should no longer have a solid collision box.